The digital world of today has enabled customers to thoroughly compare your products and services with that of your competitors at the click of a button. All these technological advances may make the purchase cycle easier for your customers, but they also make it much more difficult for you to stay competitive. On top of ensuring a remarkable online presence, you must also be able to create a compelling and engaging point of sale experience. Your storefront is more often than not, the very first live interaction that someone will have with your business. That said, you need to make sure that is welcoming and impressive. A very affordable way to do that is through window wraps, which will not only help you make a first good impression but also enable your business to form good relationships with customers. Having a unique and creative window wrap with a compelling message will drive more traffic to your business and help solidify the recognition and trust that your customers are putting in you. However, just like any form of advertising or marketing, there are tricks to the trade and you should be aware of them before hopping on the success train. Here are a few things you need to keep in mind when customizing your window wraps with the window wrap company. You need to go for a message that is large and noticeable. It is imperative that people can read your message without hurting their eyes – because let's be honest, no one's going to bother with that much effort. Ask the company to make the letters big enough so that they can be read from a distance. When it comes to window wraps, less is more. You can always supplement your current message on the outside with additional messaging after the customers have entered your store. However, you do not want to lead with too much information. Make your message short and sweet, so that it arouses curiosity and compels people to take a step further to check out your business. To do that, you will need to direct your message to the customer. Remember, most probably they have been researching you and your competitors online before arriving at your store. To make them stick around, you will need to give your customers a nugget of information that makes them stay. Highlight your core competencies and USP in a way that will make visitors choose you over their competitors. 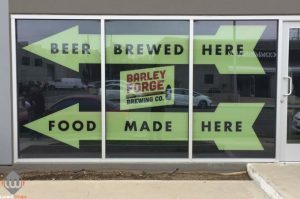 Even though there are countless measures you can take to improve your point of sale marketing, window wraps are an excellent place to get started since they will drive more traffic and capture more attention. 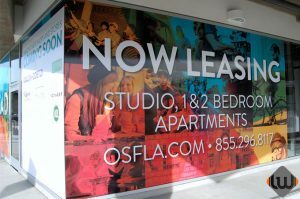 To learn more about custom window wraps for your business, contact the Lucent Graphic Solutions team today. Your consultation with us is free.